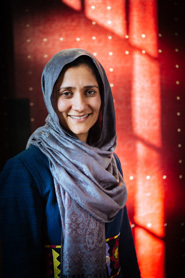 In celebration of Martin Luther King, Jr. Day, Williston Northampton welcomed Shabana Basij-Rasikh, an Afghan education activist and co-founder and president of the School of Leadership Afghanistan (SOLA) to campus on Monday, January 20. Rather than flee, her family decided to stay in Afghanistan and educate their four daughters secretly, illegally. For the next five years, Ms. Basij-Rasikh dressed in boy’s clothing and took her older sister to a secret school in the home of one of their neighbors. More than 100 young girls attended classes in this tiny makeshift school. Ms. Basij-Rasikh remembers constantly fearing that the Taliban would discover the school and kill everyone inside.